Meet my best good buddy, Banjo. 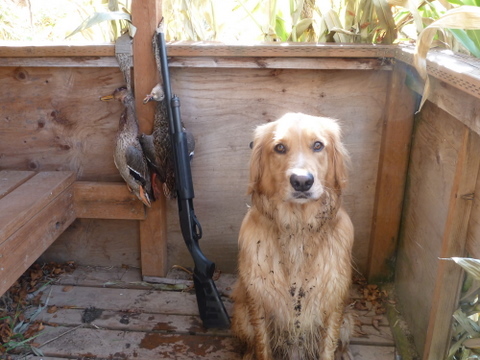 He’s a four-year-old purebred golden retriever who is getting ready for his second season as a gun dog. 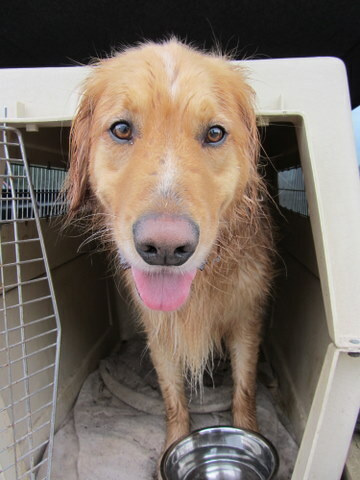 Banjo loves being outdoors, getting wet and muddy, and chasing birds. Oregon has 107 days of duck hunting fun, starting in mid-October and Banjo has been training steadily in preparation. Waterfowl training is tough business. The dogs have to retrieve under all conditions and do exactly what you tell them. If they don’t see where the bird went down, the dog has to follow your verbal commands and hand signals until he finds it. If the bird looks or smells funny, is covered in mud, blood, grass, or anything else you might find outdoors, the dog has to pick it up, bring it back, and hold it until you take it from him. It takes years of training for the dog and owner to become “finished” and able to function as a team under all conditions. Neither me nor Banjo is finished yet, but each month we get a little closer. To Banjo’s credit, he doesn’t have the gungho drive of a field trial dog, but he does have excellent “marking” skills (watching something fall from the sky and being able to run directly to it). Marking sounds easy, but it gets really challenging at distances beyond 100 yards and over uneven terrain. We practice retrieving marks and “blinds” (retrieving an item without seeing it fall) over land and water, under lots of different conditions. Through repetition and variation, Banjo is building confidence and we are learning to work as a successful team under all conditions. In the video shown above, Banjo is retrieving a mark on the other side of the pond. It’s important that he learn to swim straight out to the mark, pick it up, swim straight back (not run along the bank and try to find a shortcut), hold the item while he gets out of the water and shakes, and then release the item “to hand” when I ask for it. That’s a lot for one doggie brain to learn and remember, especially in a new place full of new smells and distractions. As long as Banjo keeps learning and having fun, I’ll keep training him. He hasn’t reached his limit yet and he really enjoys working as a gun dog. It brings a special kind of satisfaction to be part of a man-dog team that’s performing well. Banjo needs me to bring the ducks from sky to water and I need him to go and retrieve them. With only six weeks left until duck season opens, we can’t hardly wait! This entry was posted in Gun Dog, Hunting and tagged Duck Hunting, golden retriever, Gun Dog, Waterfowl training. Bookmark the permalink. Banjo’s a hell of a retriever, but what is really impressive is that he “shakes” on command! Outstanding Banjo!!! That swim alone is impressive to me. I am the proud owner of one of those but he seems to be the polar opposite of Banjo except he is yellow not black-his attributes include stealing hot dogs,sleeping on furniture(on his back spread eagle),clearing rooms with his rawhide gas,and the list goes on. He will fetch the hell out of a tennis ball until fatass wheezing kicks in. He’s my jewel and I love heem! Banjo rocks. Oh, Banjo shares some of those wonderful attributes too. Leave any food out and he claims it immediately. His favorite seems to be stealing the butter dish off the countertop and eating the entire stick of butter in record time. He can even grab the butter dish with his teeth (completely silent) and set it on the floor. He’s a professional!